Adapted to the needs of oily hair and very bold. Nod� G is a shampoo treatment seboregulator, not detergent, tailored to the needs of oily hair and very bold. 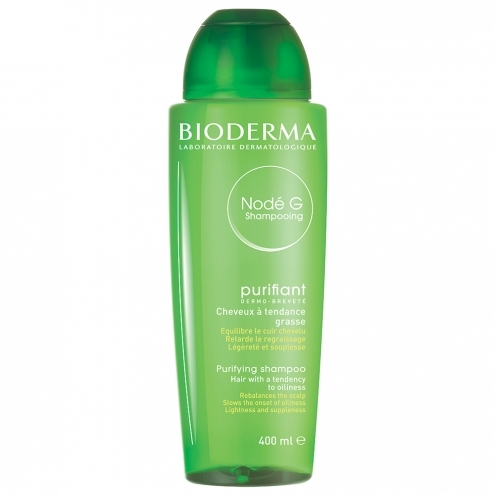 The non-detergent cleansing base of Node G controls the flow of sebum. Calcium sensors prevent the formation of calcium salts of fatty acids that increase the hair and give them a shiny appearance. Seboregulator active, essential oil of sage cleanses the scalp and maintains the balance of flora, thus limiting the risk of irritation. The formula gives the right dose volume property, conditioner and anti-static. Lather and massage the scalp. Aqua, Caprylyl / capryl Glucoside, Sodium Lauroyl Oat Amino Acids, PEG-6 Caprylic / Capric Glycerides, Polyquaternium-16, PEG/PPG-14/4 Dimethicone, Quaternium-80, VP / dimethylaminoethyl methacrylate Copolymer, Disodium EDTA, Benzoic Acid, Fragrance (Fragrance), Dehydroacetic Acid, Phenoxyethanol.